The PRESIDENT brand is intimately acquainted with the world of Citizen Band (CB) radios. Groupe President Electronics from Europe has been a leader in the world of CB radios since 1978. 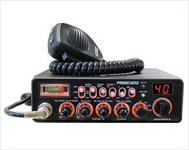 CB Radio is voice communication service for use in personal and business activities. CB radios do not require any license for purchase or usage in India. It has a unique value proposition as an open, free of charge, two-way communication between all users in a localized area. CB transmission is legally made on the frequency band of 27 MHz and, depending on the radio, on one or more of the following three modulation modes : amplitude modulation AM, frequency modulation FM (communication over short distances of flat, open ground) and single side band SSB (communication over long distances, according to atmospheric conditions). These radios can be divided into three categories : "mobile" radios are designed to be installed in a vehicle. "Portable" radios are autonomous and have no exterior power supply. The term "base" is used for radios which are designed for use in a set place in a residence or office. 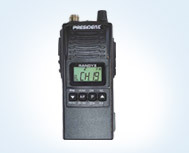 The President brand provides a wide range of high quality transceivers and antennas.